We recommend visits to our resident hygienist, Bee, every three months, although six months is also acceptable. 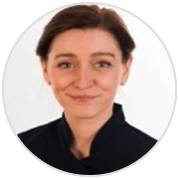 Bianca (‘Bee’) graduated as a dental hygienist and therapist in 2013 and was awarded the Dental Therapist of the Year Award – and the paediatric prize for her year group. “I love to treat people. I know the value of the mouth feeling ultra-clean and I am continuously learning new ways to bring the latest dental knowledge and procedures into my practice,” says Bee. Dental hygiene treatment is available as often as a patient requires it with ‘Direct Access’. It is recommended that you come in for regular hygiene appointments to ensure your mouth stays clean and healthy. Cosmetic makeover, teeth whitening and hygienist packages are available to you as soon as we know your requirements. Bring a new patient – a friend or family member – for a back-to-back appointment and receive a token of our appreciation: usually a great gift or a discounted treatment. Oral hygiene for the whole family – weekend bookings are available for a minimum of four people. Pre-wedding clean and whitening for the bride and groom’s families, bridesmaids and groomsmen: we will create long-lasting shining smiles where we can and provide good advice along the way. Special promotional packages at 20% off normal fees are available. A perfect gift for your wedding troop!